The home competition is a great opportunity to show off your best fish without having to uproot them and bring them down to the jar show. The greatest benefit is that your beautiful aquascaped tank will be giving you continued pleasure long after the judges have left. Be a part of this year’s home competition! The home competition is held annually between April and June. Junior category for members 12 and under (great way to get your kids involved in the hobby) Kids go wild! This year’s home competition will take place on Saturday, June 3rd, 2017. You must be available to show your aquarium(s) that day. We will try to let you know in advance the approximate time the judges will be by to see your aquarium(s). If you enter an aquarium and you are out of town, you may be asked to show your aquarium via Skype or other methods to see your aquarium to save your judges driving time. We want to be fair to all entrants as well as the judges. A maximum of 5 aquariums per family, and a limit of 3 in any one category. If you have any questions, please contact the Chairperson: Al Holm. The home competition judging is broken down into THREE general areas. The overall look of the aquarium setup (pleasing to the eye). Ability of the aquarist to present a harmonious biotope for fish, plants and other natural aquascaping materials. A well lit aquarium, clean and clear, heaters, filters, tubing etc hidden or disguised. 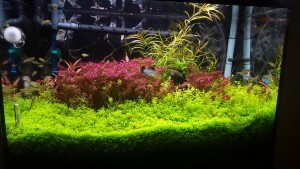 A good variety of colors in plants and fish. An epidemic of ick, velvet, fin rot, etc will eventually disqualify the entry. Points will be deducted for undernourished fish, torn fins, etc. Plants with dead leaves, holes, roots sticking out, will cause points to be deducted as well. Enough fish and a variety to fill all areas of the aquarium. Taller plants placed to the back or sides of the aquarium. The ability of the aquarist to create a natural biotype. A strong focal point drawing the viewers eye, plants, driftwood, rocks, etc. The ability to create a three dimensional viewing field by tracing them from front to back. Use natural colored gravel. Solid or dark colored background preferable over printed aquascapes. No incongruities like seashells in freshwater.